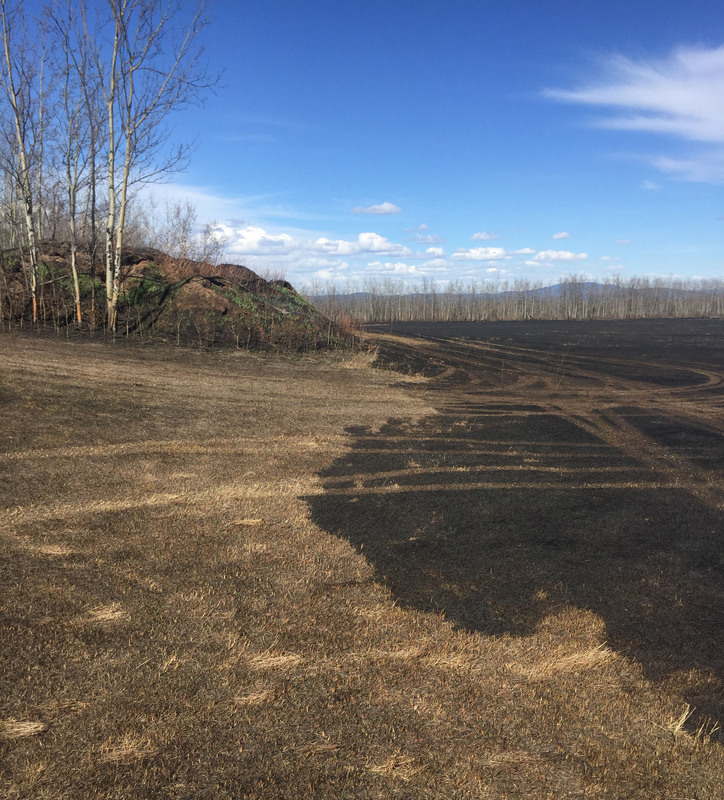 Firefighters from the Alaska Division of Forestry, Fort Greely and Rural Deltana Volunteer Fire Department acted quickly to corral a 25-acre grass fire in Delta Junction on Thursday afternoon that closed Nistler Road for a short time due to heavy smoke. Smoke from a nearby grass fire crosses Nistler Road early Thursday afternoon near Delta Junction. The road was closed for a short time due to reduced visibility caused by the 25-acre grass fire. Photo courtesy of the Delta WindThe 4.5 Mile Nistler Road Fire was reported at 12:01 p.m. Multiple engines from the Division of Forestry, Fort Greely Fire Department and Rural Deltana Volunteer Fire Department responded. Firefighters were able to contain the fire before it reached the road and had it under control in about one hour. Due to reduced visibility caused by heavy smoke, Alaska State Troopers were called in to conduct traffic control. The road was closed for about 20-30 minutes due to heavy smoke. “The homeowner was standing right there and he tried to suppress it but couldn’t catch it,” he said. The wind pushed the fire into trees and weeds along the road that generated considerable smoke, prompting fire managers to call in troopers for traffic control. The fact that the previously burned ground ignited and carried the fire was a surprise to Pease-Madore. The fire illustrates how dry conditions are in the Delta area, he said. It’s fortunate the fire didn’t occur earlier in the week when wind gusts were 40-50 mph, Pease-Madore said. Controlling the fire in those kind of conditions would have been much more problematic, he said. 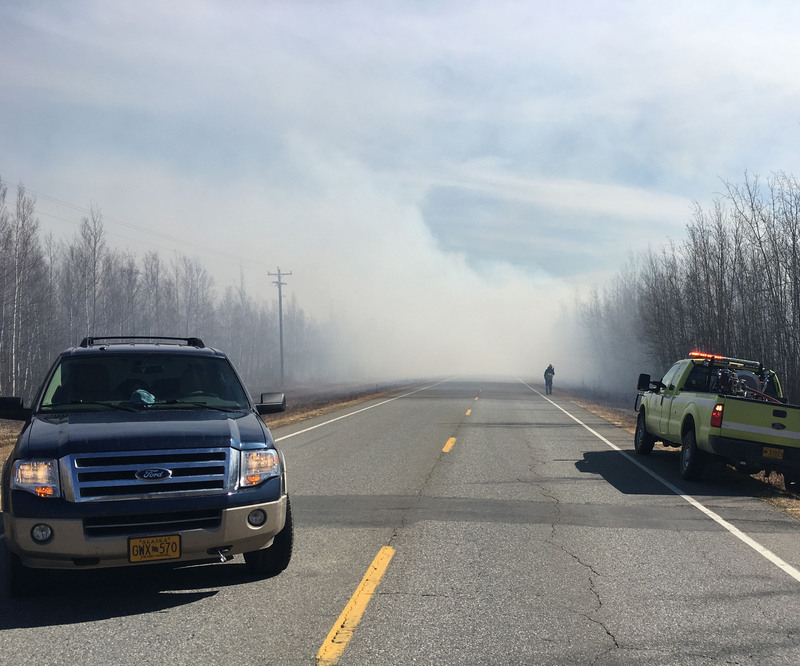 The Division of Forestry’s White Mountain Type 2 Initial Attack Crew based in Fairbanks also responded to the fire, arriving on scene at 2:40 p.m. The 20-person crew spent the afternoon and early evening hours mopping up and searching for any hot spots that remained.